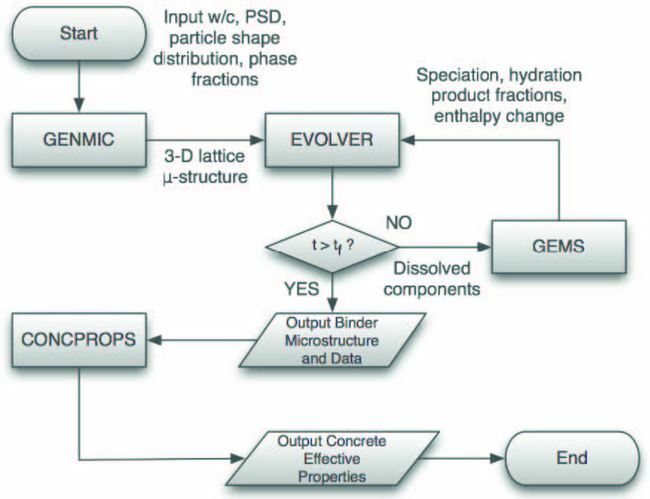 THAMES (Thermodynamic Hydration And Microstructure Evolution Simulator), is a model that describes cementitious binder microstructures and calculates important engineering properties during hydration and degradation. 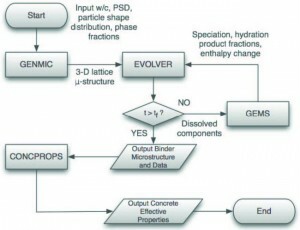 THAMES serves as a virtual “microprobe” that will be called by other programs in the integrated CBP model to update microstructure (e.g., pore space volume and connectedness) and properties (e.g., diffusivity, elastic moduli) as hydration and degradation proceeds through the projected life time of the barrier material. THAMES is built around a thermodynamic engine, which rapidly predicts bulk mineral phase volumes as a function of time in cement paste microstructures evolving by hydration or degradation phenomena. However, the bulk information alone is insufficient to make accurate predictions of transport properties and mechanical properties—microstructure information is also required. A model must predict not only the overall phase quantities,but also how these phases are distributed in space. THAMES ultimately will include 1) a module for generating a representative 3-D initial microstructure of cementitious particles in water (GENMIC), 2) a module for simulating microstructure changes (THAMES) guided by the thermodynamic calculations (e.g., GEMS), and 3) a module for calculating the elastic moduli, DC conductivity/diffusivity, and permeability on the predicted cement paste and mortar/concrete microstructure (CONCPROPS).